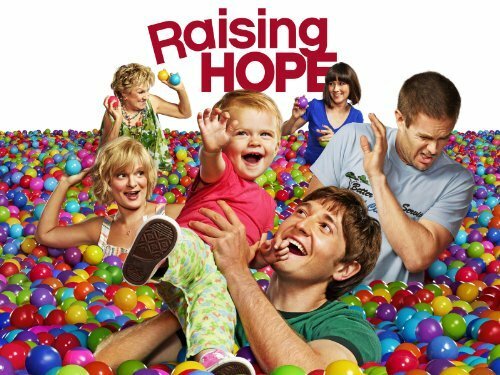 Quick Thoughts: RAISING HOPE, "Jimmy's Fake Girlfriend"
Raising Hope is a show that I stared watching from the beginning since it followed Glee, but it's kind of fallen off of my radar now that it's been pushed back by a half-hour because I find myself doing other things after New Girl ends. I do try to keep up with it as much as possible, and I was really glad that I tuned in for "Jimmy's Fake Girlfriend." One of the challenges that this show has is being able to balance the blue-collar humor with the genuine heart, and I'll admit that I tend to tune out when it relies too heavily on the first part, but Raising Hope can be one of the better sitcoms on TV when it nails the emotional beats. The reason why "Jimmy's Fake Girlfriend" worked so well was because it laid off the poor people jokes and dialed up the heart. Jimmy has been pining after Sabrina for a season and a half now, so it seemed appropriate that the Valentine's Day episode would be the one where he made his big move. Like the episode title suggests, Jimmy decided to hire an actress from an improv group to pose as his girlfriend as a way to make Sabrina jealous, and it worked a little too well because she dumped her boyfriend after a double date. Now, the set up was a classic sitcom trope that we've seen a million times over, so there wasn't anything particularly special about it, but Raising Hope zigged instead of zagged. Other shows may have kept the lie going for a little while longer, but Jimmy decided to come clean with Sabrina almost immediately, and the way he did it (having the improv group chronicle their friendship) was pitch perfect. Sure, their relationship may have started off because of a lie, but I'm willing to overlook that for now because things just felt right after "Fake Girlfriend." Jimmy and Sabrina will not be added to the Mt. Rushmore of "Will They, Won't They" Couples, but their journey has been fun without being annoying up until this point. I hope now that they're finally together that it sticks because the last thing this show needs is the tired on-again, off-again crutch, but will have to see. Regardless, "Jimmy's Fake Girlfriend" was a new chapter for Raising Hope, and let's cross our fingers for more in our future.